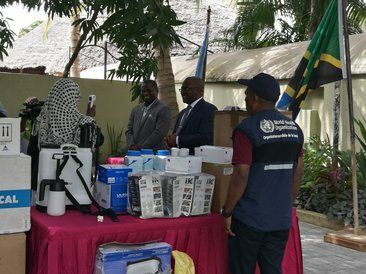 Dar es Salaam and Zanzibar, July 2018: Today, the World Health Organization provided the Ministry of Health Mainland and Zanzibar medicines and equipment for Ebola preparedness and control of Malaria and Neglected Tropical Diseases in the country. 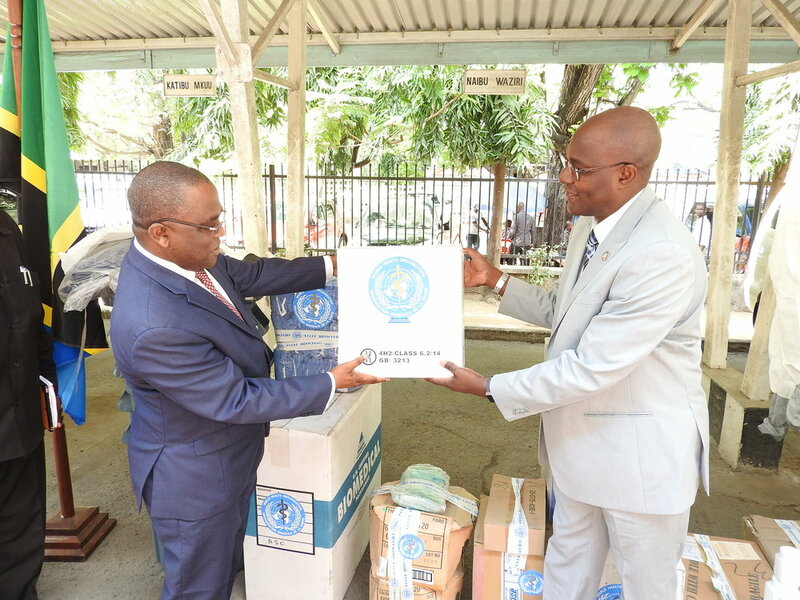 Items provided by the WHO Country Representative, Dr. Adiele Onyeze included: tablets of Albendazole (400mg); tablets of Praziquantel (600mg); Filariasis test kits; thermo flash evolution thermometers; packages of Ebola PPE Kits and Artemether-Lumefantrine drugs all worth a total of USD 2,363,718 equivalent to Tanzania Shillings 5,326,167,459. The handing over ceremony was presided by the Permanent Secretary, Dr Mpoki Ulisubisya in Mainland and Hon Deputy Minister for Health, Ms Harusi Said Suleiman in Zanzibar. Both events were witnessed by Directors and Programme Officers from the two Ministries of Health, WHO staff and members of the media. In his handing over speech, the WHO Representative, Dr Adiele Onyeze commended the Ministry of Health Zanzibar for efforts undertaken in the control and elimination of Schistosomiasis, Lymphatic Filariasis and other emerging infectious diseases such as Ebola and Cholera. He also commended the Ministry of Health in Mainland for the on-going efforts towards strengthening national preparedness for Ebola and remarkable progress made with regards to malaria control and elimination of Neglected Tropical Diseases. He said, “we note a steady reduction of reported malaria cases in endemic regions across the country. Use of Long Lasting Insecticide Treated Nets (LLINs) has improved as well as the use of Malaria Rapid Diagnostic Tests (RDTs). The country has reduced districts requiring treatment for NTDs, in particular, from 97 to below 30 for Lymphatic Filariasis and from 34 to below 5 for the blinding trachoma disease”. He concluded by reassuring WHO’s commitment to continue working with partners to support the Ministry of Health and the Government of Tanzania ensure attainment by all people of the highest possible level of health. In his acceptance speech, the Permanent Secretary for Health, Dr Mpoki Ulisubisya said that the items provided will complement the country’s preparedness efforts in response to the threat of emerging and re-emerging diseases. Emphasizing on the importance of multisectoral joint action, he said, “control of disease outbreaks such as Cholera and Ebola hinges on strong alliances and partnerships. Early detection and prompting reporting is key for containment of disease outbreaks in line with the International Health Regulations (IHR). With this support Tanzania will be in a better position to fulfill its IHR obligations as well as have the capacity to control Malaria and Neglected Tropical Diseases”. 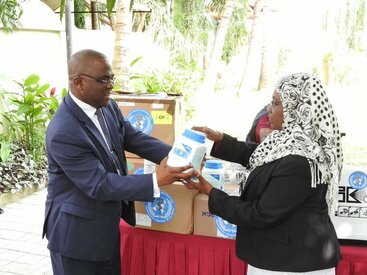 Receiving the items in Zanzibar, Hon Deputy Minister for Health, Ms Harusi Said Suleiman echoed sentiments by the Permanent secretary for Health and highlighted achievements made so far towards elimination of Malaria and NTDs in the island. She was optimistic in that items provided will complement the country’s efforts in meeting its IHR obligations and scaling up of high impact interventions for the control of Malaria and NTDs. 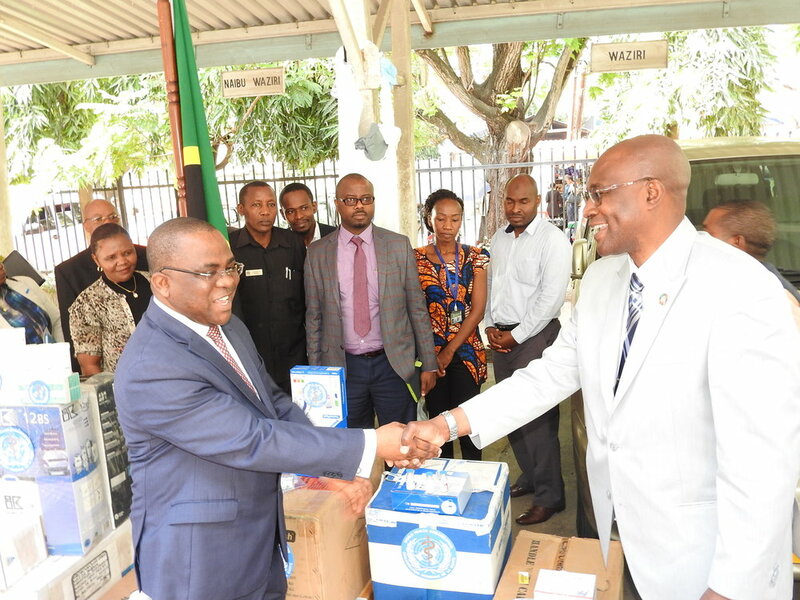 Both Ministries expressed appreciation to the World Health Organization for the timely support to the people of Tanzania and assured that the medicines and equipment will be used as intended.